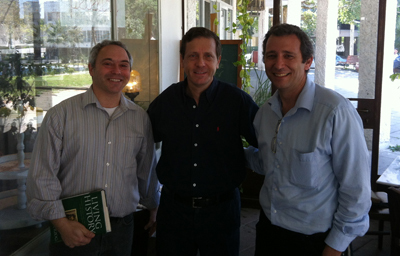 Yitzchak Isaac Herzog, nicknamed Bougie in Israel, served in the previous and current Israeli government as Minister of Welfare and Social Services. He is a member of Knesset representing the Labor party, and is known in Israel as an advocate for the rights of the disadvantaged and defender of the working class. Bougie is the grandson of the first Chief Rabbi of the State of Israel, Isaac Halevi Herzog, whose doctoral thesis, Hebrew Porphyrology, is a seminal work on the topic of tekhelet. His father Chaim was the sixth president of Israel. 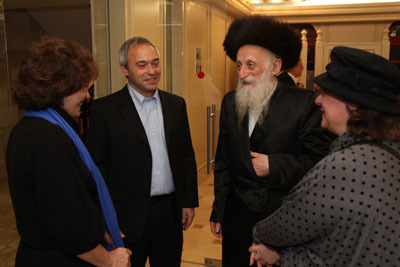 Rabbi Avraham Twerski, M.D. is a leading figure in Orthodox Judaism who merges both the secular and Torah worlds. He is a noted psychiatrist specializing in the treatment of addictions, and is a scion of the great Chasidic dynasties of Chernoble and Sanz. Rabbi Twerski was one of the first tekhelet enthusiasts and has offered powerful insights into emotional significance of color in general and tekhelet in particular. Rabbi Twerski's interview can be seen in P'Til Tekhelet's video found here. Professor Roald Hoffmann from Cornell University received the Nobel Prize in Chemistry in 1981. He has written extensively on the chemistry of dyeing, and has long been interested in tekhelet. On one visit to Israel, Prof. Hoffman joined our group in an expedition to Dor where we caught snails, extracted the glands, and dyed wool. He has been an enthusiastic supporter of our organization and a wonderful source of information and expertise for all of our chemistry related questions. Our excursion with Prof. Hoffman to Dor can be seen here. Yuli Edelstein is the Israeli Minister of Public Affairs and the Diaspora. A former aliya activist and Hebrew teacher in Moscow and a Prisoner of Zion (1984-87), he immigrated to Israel in 1987. He has been involved in the tekhelet project for many years. He was one of several dignitaries who addressed the audience at the P'Til Tekhelet 20th anniversary event, where he presented Rav Tevger, our organization's founder, with a tallit to be used in the Moscow synagogue. His address can be viewed here. 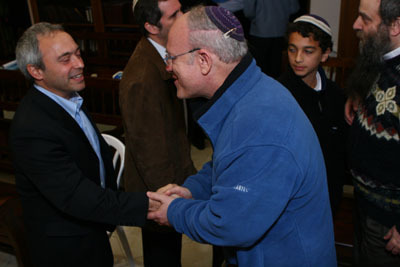 Born in the United States, the Honorable Neal Hendel made aliyah in 1983. A judge since 1988, he served first in the Beersheba District Court, and in 2009 was appointed to the Supreme Court of Israel. His moving words about his personal connection to tekhelet can be viewed here. 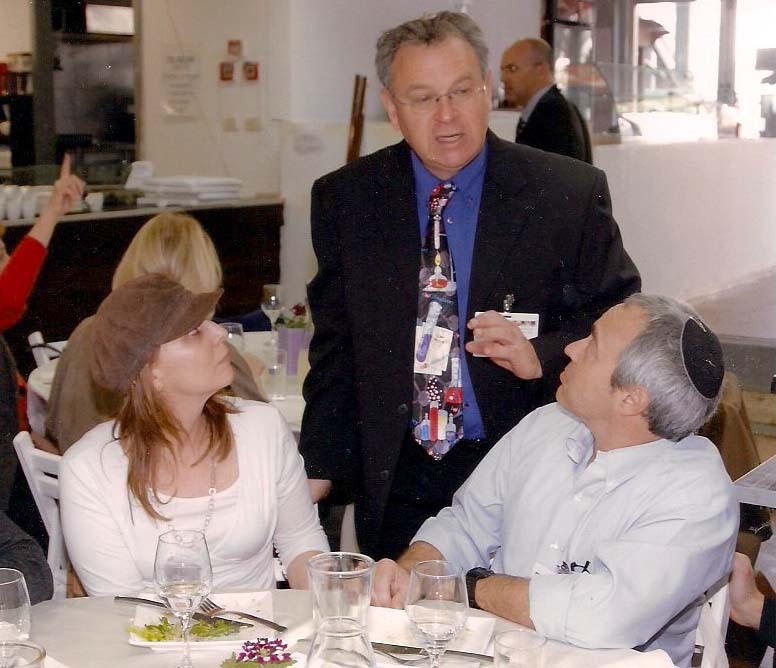 Professor Tzvi Koren, Director of the Edelstein Center for the Analysis of Ancient Artifacts discusses his recent research with Baruch and Judy at the International Edelstein Color Symposium 2011. 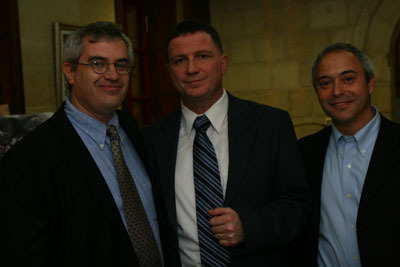 The event was held at the Shenkar College of Engineering and Design in Ramat Gan, Israel. Prof. Koren announced his analysis of a fabric unearthed on Masada by Yigal Yadin dating to around the first century C.E. The piece of cloth had a stripe of dark blue wool embroidered on it which High Performance Liquid Chromotography analysis showed to have been colored with dye obtained from Murex trunculus. The full story that accompanied Prof. Koren's announcement can be found in the NY Times article Rediscovered, Ancient Color Is Reclaiming Israeli Interest. This site is © Copyright website name 2010, All rights reserved. Design by website templates.